This Sterling turquoise two stone ring is entirely hand crafted featuring 2 small rectangular genuine turquoise with great micro matrix. 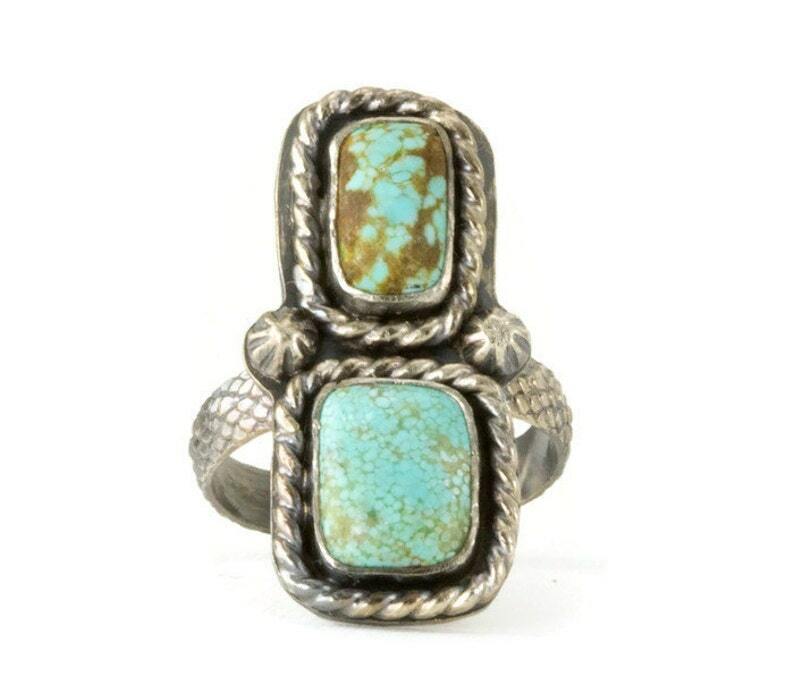 A super look for southwest or boho style, this double turquoise statement ring has stones set on solid sterling with a sterling twist wire trim on an uninterrupted textured snake pattern band 4 mm wide and 1.4 mm thick- really comfortable to wear. Interior of the band has been contoured for comfort. The entire setting is 1 1/4 inch long and 3/8 inch wide at the handmade flower accents. Ring is a size 8 and ready to ship. The turquoise stones are a beautiful vivid blue color, with good matrix showing. Each of the turquoise cabs are set into smooth bezels, which are surrounded by a twist rope border and two handmade silver flowers in the middle where they meet. Larger stone is 10.6 x 8 mm, smaller ston is 11 x 6.6 mm. This is not a super large statement ring but with these two beautiful stones, it will make one anyhow! Your ring will come packaged suitable for gift giving. I include a drawstring storage bag and a Sunshine polishing square with your ring.